CONSTRUCTION - Made of solid high-quality cast iron with no weld, no seam casting and coated in an industrial powder coated finish for enduring protection. Though originally designed for the use of Red Russian Army soldiers and professional athletes, kettlebells are an accessible way for anyone to get quality strength training without going too far out their way. Kettlebells are uniquely different from free weights in the diverse range of different exercises that be performed with them, so both fitness newbies and fitness addicts alike can benefit from trying them out. The following kettlebells are some of best-reviewed, toughest, and most ergonomic choices on the market. CAP Barbell’s enamel coated kettlebells are made with enamel-coated iron for a glossy finish. To protect the owner’s flooring from any unnecessary damage that might occur from letting them fall too abruptly, the kettlebells are made with a tough rubber base. To provide a higher degree of durability, the ergonomic handles have been reinforced with steel. These enamel coated barbell have been purposely designed with smooth handles to make them more ergonomic. The cast iron core is coated in high-gloss enamel to make it as comfortable as possible when being swung to and fro. The weight range for CAP Barbell’s enamel coated kettlebells is as follows: 10lbs, 15lbs, 20lbs, 25lbs, 30lbs, 35lbs, 40lbs, 45lbs, 50lbs, 60lbs, 70lbs, and 80lbs. The handles in question have not be welded onto the base, but cast on. Because there are no bolts or screws, there isn’t any risk of the weight suddenly flying off the handle and doing damage without any warning. Both weights are made to accommodate hands of any size, without any great effort needed to secure a solid grip. The handle itself is approximately six inches wide. Owners should be advised that while the enamel is smoothed, it is a material that has a certain tendency to decay over time. While there isn’t a terribly high risk of the floor being severely scratched by the kettlebells, depending on exactly how heavy the weights used by the owner are during the exercise, it could very well be possible to dent the floor due to carelessness. 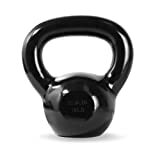 One customer testified that before finding out about CAP kettlebells, they had been looking around their local sports good stores in search of something that they could use as a resistance option at home. The customer was never able to make frequent gym trips due to their hectic daily work schedule, but they still wanted to find a way to maintain an adequately healthy lifestyle. Eventually, they came to settle on the CAP 35lb kettlebells due to what they’d heard about the smoothness. True to the testimonies and their expectations, the CAP kettlebells were satisfyingly smooth in the customers’ hands. Unlike kettlebells made from more abrasive materials, the customer was relieved to find that CAP’s enamel coated kettlebells didn’t burn or cut up the skin of their hands due to rough and sharp edges. Another customer testified that they were particularly pleased with how sturdy the kettlebells were due to the handle bars being cast onto the main weights. In addition to using them for standard kettlebell swinging exercises, the customer suggested that the flat surface bottoms of the bells made them potentially useful as improvised pushup handles. Though the customer was largely satisfied by the kettlebells overall, there were still some areas that they felt just left a little bit to be desired. While enamel itself was just as smooth as advertised, the customer was slightly concerned that the glossy material might actually be slightly fragile. When the kettlebells arrived at the customer’s doorstep, they found that a fist-sized portion of coating had actually been chipped off due to hitting the other bells during shipping. Because of this, prospective owners should be advised to anticipate some potential wear and tear to result from consistent use. The customer went on to mention that the handles, while particularly easy to grip, were slightly narrower than the kettlebells that they’ve grown accustomed to in the past. Because of the narrow handles, they found that two-handed swings and changing the weight between their hands took a bit of getting used to. If prospective customers have been using certain kettlebells for some time before trying out CAP’s enamel coated barbells, then they would be well-advised to prepare for a possible difference in the feel of gripping the sub-4” handles – mentally preparing for the grip could very well help the owner potentially prevent incurring a careless injury. Overall, while the customer was very satisfied with the product, they mentioned that the packaging that CAP’s enamel coated kettlebells were delivered to them in may not necessarily be the best option for the preservation of the kettlebells’ material. The kettlebells were held in a plastic bag inside of a box, which didn’t protect them from any chipping that might occur in the process of delivery. Thankfully, since the time of the customer’s delivery, CAP has made an invested effort into providing more effective delivery packaging methods in some of their orders, though prospective buyers should still be wary of the possibility that their kettlebells may be slightly chipped upon receipt – aside from that, the general reception to the bells as strength training tools is resoundingly positive across the majority of customer testimonies. Yes4All cast iron kettlebells have been made with an especially wide, textured handle to provide the user with a more secure grip. To protect the kettlebells from being damaged by the elements, the surface of the kettlebells has been coated in weather-resistant paint. The handle of the Yes4All kettlebells are measured at around 1.25 inches in diameter. Due to the weather-resistant paint covering the surface of the bells, they’re suitable for either indoor or outdoor use. The smoothness of the handle makes it easy to use them without as much of risk of having them suddenly slip out of the user’s hands during particularly dynamic exercises. The Yes4All kettlebells feature a distinctly flat bottom in contrast to the roundness of the sides, making it possible to stand them on the floor or shelf. The machined flat bottom of the heavier bells makes the them potentially suitable candidates for exercises such as renegade rows; however, prospective buyers should be advised that different customers have given varying reports in regards to their success with using the flat bottom of the kettlebells for ground-based exercises. For the best possible result with using the YesAll kettlebells for exercises like renegade rows, it would probably be most prudent to use them on softer surfaces like a carpeted floor instead of concrete. The Yes4All kettlebells are available in 5lbs, 10lbs, 15lbs, 20lbs, 30lbs, 35lbs, 40lbs, 45lbs, 50lbs, 50lbs, 55lbs, and 60lbs. Since the handles are single-cast onto the main weighted body, there are no weak sports that might cause the weight to fly off of the handle at a moment’s notice. 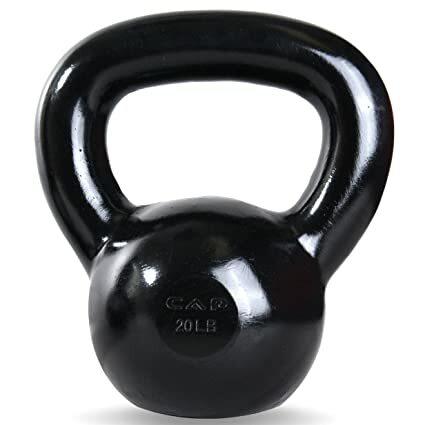 The specific name for the finish covering the kettlebell is “black power coating”. 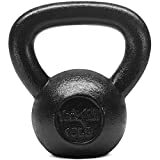 The black powder-coated finish was included as an additional protective measure to defend the kettlebells against the risks of getting chipped due to repeated friction against weight racks or each other (a semi-frequent grievance expressed in regard to enamel-coated finishes). The majority of customers have testified positively about the merit of the Yes4All kettlebells are decent tools for low maintenance weight-training. One customer in particular testified that the handle width of the kettlebells allows for the user to fit all of their fingers through the loops without having to struggle to make the fit. The customer went on to speak of the handle texture. May people often complain that their kettlebells from different brands do damage to the hands, which made the customer slightly way of trying the Yes4All kettlebells for the first time; they were relieved to discover that the kettlebells didn’t damage their hands at all, and actually had a very smooth and accommodating texture that made them pleasant to hold from just about any angle. While there are some contrasting opinions on the effectiveness of the kettlebells for exercises such as renegade rows, the customer stated that they personally found the Yes4All kettlebells to be just “level enough” for doing renegade rows with relative ease. The reviewer suggested that any customers who want an even more stable kettlebell for doing renegade rows and pushups might be better off investing in hexagonal kettlebells for that specific purpose, though they themselves did not have any significant issues doing such with their Yes4All kettlebells. Another customer also found that the Yes4All kettlebells were suitable for their resistance workout needs, but voiced some uncertainty about whether or not customers with smaller hands would be able to firmly grasp the handle diameter of the 45lb kettlebells. These GoFit kettlebells are coated with a vinyl finish that keeps them protected from damaging abrasion on contact with tiled and hardwood floor surfaces. There are two different variations of the kettlebell’s shape: the contoured vinyl-coated kettlebell, and the premium vinyl-dipped kettlebell. The contoured shape variation is manufactured with a particular form that makes it particularly forearm friendly, and the premium variation is made in a traditional cannonball style; both variations of the GoFit kettlebells are given equal vinyl-dipped protection. GoFit kettlebells can be bought in the following weight variations: 7lbs, 10lbs, 15lbs, 20lbs, 25lbs, 35lbs, 40lbs, and 45lbs. The different weight variations of the GoFit kettlebells are color-coded. The kettlebell is constructed with solid cast iron that connects the weighted body and the handle without any bolts or weak points at the areas of attachment. The vinyl-dipped coating is rubberized, making it less harsh on any surface that it’s placed on. The handle has a two-toned gloss to make it more ergonomic and smooth when handled. The handles are wide enough to accommodate two average-sized hands, though some users might find the space to be slightly cramped. The kettlebell comes with an accompanying workout DVD that the owner can use to explore different resistance exercises, which most customers testified was surprisingly satisfying. One customer with a semi-regular workout regimen (5 times a week, with 3 biking sessions and 2 lightweight dumbbell session) decided to buy the GoFit kettlebells to give kettlebell exercises a try for the very first time. They had been recovering from some semi-serious health issues that had compromised their formerly much more intense regimen, so acclimating to their new routine steadily and gradually was their top priority. The customer testified that the 10-pound kettlebell was exactly what they had been looking for. The reviewer suggested that prospective buyers (who have never used kettlebells before) be aware of the fact that kettlebell exercises are uniquely different than the kinds of weight lifting repetitions that most people are used to, and so starting with a slightly lighter weight that what the owner assumes they can manage would be wise. Another customer decided to buy two of the GoFit kettlebells locally and testified that they found the presentation, balance, handle, and plastic coating to all be more than worth the price they paid. While some reviewers have claimed that the kettlebells might be a little bit on the heavier side for certain users, this customer claimed that the weight had no overall bearing on their quality. The customer shared that they had a history of mistakenly investing in substandard kettlebells in their haste to make their purchase as quickly as possible, and had run into all sorts of problems such as rough handles, improper finish and poor balance; they encountered none of these problems while getting acclimated to their new GoFit kettlebells and would recommended them to any fitness enthusiast. The Tone Fitness Vinyl kettlebells have aesthetically designed to have a sleeker profile than most kettlebell brands. True to the name, these kettle bells have been covered in a vinyl finish that makes it safer to use them on hard surfaces without as much of a risk of causing scratches or dents. As far as functionality is concerned, the kettlebells were made so that the grip is smooth and accommodating for all users. 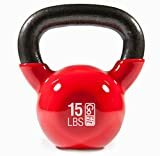 These particular bells are billed as being a slightly more affordable alternative to more high-end kettle bell options that are generally made of cast-iron with an enamel finish. Prospective customers should be aware of the fact that these kettlebells may contain one or more phthalate chemicals that the State of California has recognized as being potential contributors to the risks of reproductive harm or birth defects. Customers have testified that the handle is wide enough to at least accommodate two adult female hands, but men’s hands may or may not be able to fit into the handle quite as easily. The kettlebell’s handle can be easily and effectively gripped by both right-handed owners and left-handed owners with equal ease. 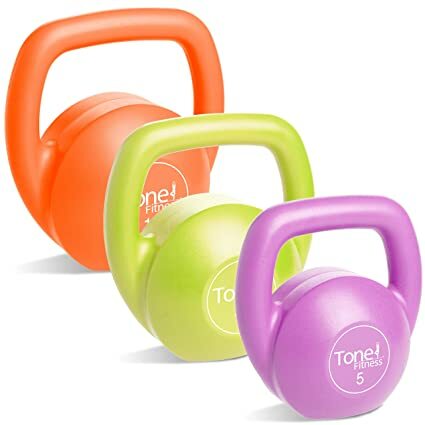 One reviewer noted that she found her Tone Fitness vinyl kettlebells to be deceptively large when took them out of their packing for the very first time. She noted that the 10lb kettlebells had more dimensional mass than the metal 10lb kettlebells she’d used in the past, but they were still perfectly usable. She expressed a lot of satisfaction at the fact that the vinyl coating was very kind to her palms throughout the entire workout. Another customer also testified that having a smooth, vinyl handle in place of a rough metal handle made a world of difference. They stated that their busy schedule makes it particularly difficult for them to consistently get in a high-quality workout during the week, and so having access to kettlebells with an ergonomic handles helped to mitigate the mental stress of worrying about how to squeeze in regular exercise, along with the physical stress of a poorly-textured kettlebell. The reviewer spoke highly of the relative versatility of the kettlebells, stating that they offered much more creativity than what’s generally allowed by standard free weights. The smoothness did make the user have some initial worry about whether or not the weights would slip out of their hands from sweat, but that never happened. Overall, the Tone Fitness vinyl kettlebells are best-suited for owners who are just starting to get acclimated to kettlebell weights in general and need a reliable starter kit. The weight range is slightly limited compared to what people might typically expect from the more high-end kettlebell brands, but those who can comfortably operate within the weight range that Tone Fitness offers will be satisfied. The kettlebells can be purchased individually at 5 pounds, 10 pounds, 15 pounds or in in a 30-pound triple set. Kettlebells can be used for a multitude of different exercises, though depending on the shape of the kettlebell itself, certain exercises might be easier or harder to pull off with certain kettlebell brands than they are with other brands. Generally speaking, hexagonal kettlebells will be easier to use for ground-based kettlebell exercises like assisted pushups. You’re more likely to get delayed onset muscle soreness (DOMS) from overdoing exercises that your body hasn’t gone through quite as frequently as others, and since kettlebell exercises can be quite foreign compared to the more conventional exercises performed with dumbbells, it would be wise to start with a weight slightly lighter than what you assume could be easy for you to handle. Different materials of coating on kettlebells mean different risks of damage to the floor beneath you. Choosing an enamel, vinyl, or any rubberized kettlebell will significantly lessen the chance that you might accidentally damage your floor. Different kettlebells have different handle diameters. While most of them will generally be thin enough so that just about anyone can get a hand around them without having to strain too much, certain kettlebells will be slightly thicker than what smaller hands can consistently grip comfortably. In other cases, the space provided by the contour of the handle may or may not allow both hands inside at once. Taking hand measurements and putting them up against the dimensions of the kettlebells you’re thinking about buying could wind up saving you a lot of trouble. Kettlebells can be used for many different fitness goals, but generally, speaking, they’re best-suited for strength and endurance development. People are who primarily concerned with losing weight might very well be attracted to the convenience of kettlebells, but be advised that frequent weight training will might possibly make you heavier with higher-quality muscle development rather than immediately contributing to long-term weight loss. Long-term weight loss will more likely be more affected by proper nutritional choices than physical training. These unique weights are suitable for exercises such as the Turkish get up, swings, deadlines, squats, cleans, military press, snatches, and all other forms of general bodyweight training. Take care to choose versions with ergonomic handles and a strong, rubberized coating to get the best mileage out of them. With a consistent exercise plan, you may find that kettlebells can be the ultimate solution to fitting a high-quality workout session into the day no matter how busy you are.